International media began spreading rumors and outright lies about the Venezuelan President’s health from the time he first underwent surgery to remove a cancerous tumor from his pelvic region in June this year. After Chavez completed his fourth and final chemotherapy session last week and resumed his path to full recovery, media began disseminating wild propaganda claiming the treatment “hadn’t worked” and Chavez’s health was deteriorating. Despite numerous live telephone interventions given by the President on television this past week, the rumors wouldn’t cease. So, he put them to rest by publicly playing a game of catch with some of his staff. Tensions built Wednesday evening as the Miami-based publication, El Nuevo Herald, published a front page story claiming President Hugo Chavez had been hospitalized for kidney failure and was rapidly deteriorating. The report was based on anonymous sources and quotes from alleged individuals close to the Venezuelan government and “witnesses” to the hospitalization. Behind the Herald’s campaign has been former US Ambassador Roger Noreiga, a self-proclaimed “anti-communist” who served in both Bush administrations and was schooled in Latin American policy by the likes of John Negroponte and Otto Reich, part of the US team responsible for conducting dirty wars in Central America in the 1980s. Noriega also provided extensive support for the April 2002 coup d’etat against President Chavez, when he was US Ambassador to the Organization of American States. Noriega has falsely claimed for months that President Chavez’s health is failing and that he has less than a 50% chance of survival. 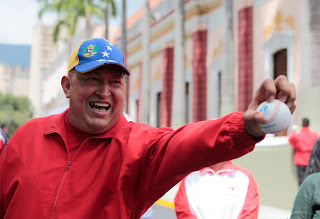 But each allegation has been disproven by Chavez himself, who has consistently informed on the positive progress of his health after a “baseball-sized” cancerous tumor was removed from his body in June. Since then, he has undergone 4 successful sessions of chemotherapy and says the cancer is “gone” fom his body. “I had cancer, but now I do not”. On Thursday, Chavez affirmed he had the best proof that his recovery is advancing fine. "I'm here; this is my answer", he told reporters at the presidential palace, raising his arms and gesturing at his body. "I am my own answer".